I haven't really begun to feel the desire to shop for Christmas, but I am currently drowning in holiday catalogs. Our mailmen started making double drop offs today (1 comes in the am with just catalogs and our normal mailman, Larry, comes in the afternoon on his regular run). 13 catalogs came in the mail just today. My recycle bin is already overflowing. It's just going to get worse. I did make my very first holiday purchase of the season today. 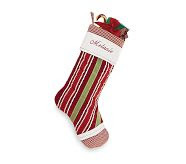 Christmas stockings! 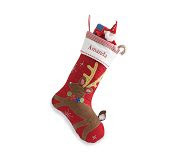 For years I have been wanting to buy really nice, keep forever, special family stockings. So I did it. I had decided on the stockings in the Pottery Barn Kids catalog... and as luck would have it... they were on sale today!!! Yippee!!! So... here they are... (and they'll be personalized too!). 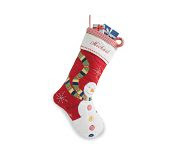 Ana It's a little silly... but just ordering these has got me excited for jingle bells and visits to see jolly old St. Nick! 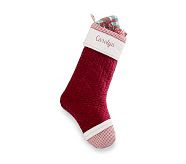 I can't wait for them to be delivered and to see our family of stockings hanging by the chimney just waiting for Santa.